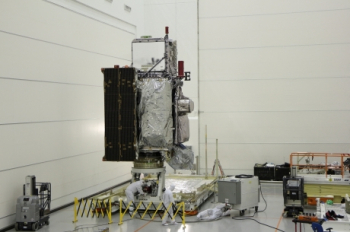 The next generation weather satellite, Geostationary Operational Environmental Satellite “GOES-R”, has arrived in Florida for pre-launch processing. The spacecraft completed a plane ride inside a USAF C-5 cargo plane, touching down on the Shuttle Landing Facility (SLF) runway on Monday ahead of being unpacked on Tuesday. 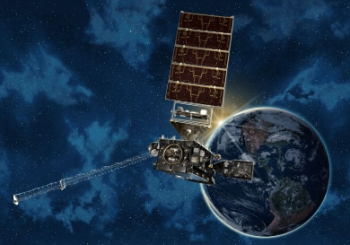 GOES-R is first of four next-generation weather satellites, tasked with working for the National Oceanic and Atmospheric Administration (NOAA). The NOAA have been quick to point out the revolution behind this new breed of satellite, claiming it will be a “game-changer for the entire Western Hemisphere”. The video series has covered the spacecraft’s development at Lockheed Martin’s facilties near Denver, through to its journey to Florida from where it will be launched by a United Launch Alliance Atlas V in her 541 configuration out of SLC-41’s pad at Cape Canaveral Air Force Station. Arriving in Florida this week, GOES-R completed its journey from Colorado inside the USAF C-5 aircraft, touching down on the famous Shuttle Landing Facility (SLF) runway at 3:16pm Eastern. “This milestone is a great achievement for the entire GOES-R team, who have worked tirelessly to get the spacecraft to Florida,” said Greg Mandt, NOAA’s GOES-R system program director. Tracking a launch date of November 4, the spacecraft will be unpacked from its transporter container on Tuesday before entering a pre-launch processing flow at Astrotech Space Operations facility in Titusville, Florida. “Our team understands the important mission of this national asset, and delivering it to the launch site moves it one step closer to providing an upgraded capability for NOAA and our nation,” said Tim Gasparrini, vice president and GOES-R Series program manager at Lockheed Martin Space Systems. One such example is its ability to provide images of weather pattern and severe storms as frequently as every 30 seconds. GOES-R’s data will support short-term weather forecasts and severe storm watches and warnings, maritime forecasts, seasonal predictions, drought outlooks and space weather predictions. Additionally, GOES-R products will improve hurricane tracking and intensity forecasts, and increase thunderstorm and tornado warning lead time. “NOAA’s GOES satellites are our nation’s weather sentinels and are vital to our severe storm prediction and warnings,” added Mr. Gasparrini. GOES-R has a primary suite of six instruments, namely the Advanced Baseline Imager, Extreme Ultra Violet/X-Ray Irradiance Sensor, Geostationary Lightning Mapper, Magnetometer, Space Environmental In-Situ Suite and the Solar Ultraviolet Imager. Lockheed Martin also designed and built the Solar Ultraviolet Imager and the Geostationary Lightning Mapper instruments that will fly aboard each of these new spacecraft. The GOES-R spacecraft bus will be 3-axis stabilized and designed for 10 years of on-orbit operation preceded by up to 5 years of on-orbit storage. The satellite will be able to operate through periodic station-keeping and momentum adjust maneuvers, which will allow for near-continuous instrument observation. The GOES-R series operational lifetime extends through December 2036, with the final satellite in the new fleet scheduled to launch in 2025. The history of weather satellites working in geostationary orbits reaches back to the Delta 2914 launches of SMS-1 and SMS-2 in the mid-1970s. 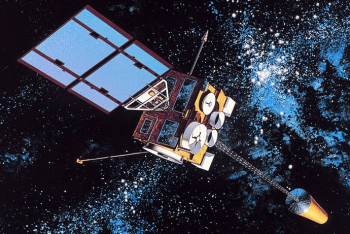 Those two spacecraft paved the way for the GOES program and a continual evolution in technology that has revolutionized weather monitoring and forecasting – one of the numerous benefits provided by space flight technology to people on Earth. A large fleet of GOES spacecraft continue to work in space to this day. 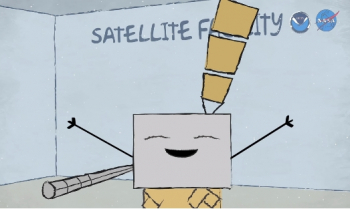 Most are either inactive or re-purposed, with GOES-3 no longer watching the weather but providing a communication link between the United States and Amundsen-Scott South Pole Station. GOES 12 through 15 are currently classed as active, with the latter the latest to launch back in 2010, atop the United Launch Alliance (ULA) Delta IV. 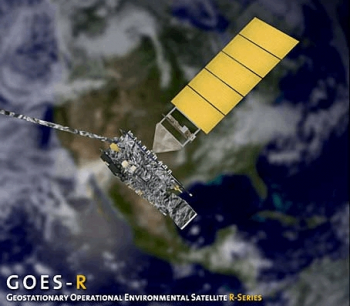 GOES-P – as it was known during its checkout period – became the sixteenth spacecraft in the GOES fleet, and the last of the three current-generation GOES-N series spacecraft for the NOAA. (Images via Lockheed Martin, USAF and NOAA).